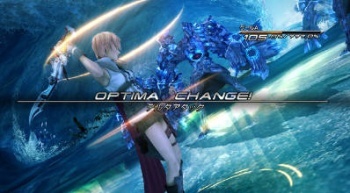 Final Fantasy XIII Ditches Leveling Up for "Crystalium"
Weekly Japanese manga-and-all-things-nerdy magazine Shonen Jump has revealed the upcoming advancement system in Final Fantasy XIII, which ditches traditional leveling for something like Final Fantasy X's Sphere Grid. Now, for everything you can say about Square-Enix's landmark Final Fantasy JRPG series, you can't say that it hasn't ever tried variations on the basic RPG "level up new skill yay!" formula. But while the games have played with how your characters learn abilities - whether completely modular and tied to other items like in FF7, learned from equipment like in FF9, or learned from attached summoned creatures as in FF6 and FF8 - the games have still largely held to the formula of "hit an arbitrary limit of experience points, level up and get more powerful." Not so in Final Fantasy XIII. The latest issue of manga magazine Shonen Jump has some scans and information detailing the game's advancement system, called the "Crystalium" System. According to the translation posted on Andriasang, defeating enemies in battle in FF13 will earn "Crystal Points," or CP - and these CP can be exchanged for new skills or abilities, like the standard Fire/Fira/Firaga tree of magic. As you purchase certain skills, your characters will unlock new available paths - my guess is that these paths will presumably lead further down their chosen fields; purchasing magic abilities will unlock more magic-based points and so on. Nor will this just be skill and abilities, either - the screenshots in the scans show purchasable nodes that increase a character's health, so one can assume that they'll be able to increase their other statistics in the same way. It all sounds very reminiscent of the Sphere Grid system in Final Fantasy X, which is good because the Sphere Grid was awesome (if rather hard to explain to people at first). True, if you spent enough time with it you'd eventually end up with characters that were all exactly the same, but that's true with almost every Final Fantasy advancement system out there, and it at least preserved the characters' in-battle identities for a while (Tidus was quick, Wakka accurate, Auron powerful, etc). A more in-depth explanation on the Crystalium System is believed to appear in Famitsu later this month as we move closer to Final Fantasy XIII's December release date. And no, I still don't know what "OPTIMA CHANGE!" means.